DURHAM, N.C. – Esses are everywhere. From economic trends, population growth, the spread of cancer, or the adoption of new technology, certain patterns inevitably seem to emerge. A new technology, for example, begins with slow acceptance, followed by explosive growth, only to level off before "hitting the wall." When plotted on graph, this pattern of growth takes the shape of an "S."
While this S-curve has long been recognized by economists and scientists, a Duke University professor believes that a theory he developed explains the reason for the prevalence of this particular pattern, and thus provides a scientific basis for its appearance throughout nature and the man-made world. "This phenomenon is so common that it has generated entire fields of research that seem unrelated – the spread of biological populations, chemical reactions, contaminants, languages, information and economic activity," said Adrian Bejan, engineering professor at Duke's Pratt School of Engineering. "We have shown that this pattern can be predicted entirely as a natural flow design." The concept of flow design, whether it be energy, rivers or human populations, is central to Bejan's theory. 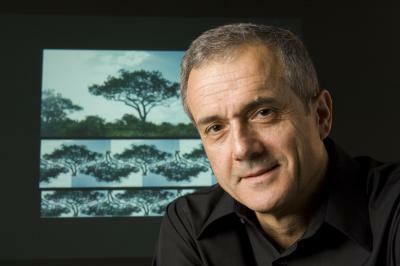 This is Adrian Bejan of Duke University. The results of this theory of the S-curve, conducted with collaborator Sylvie Lorente from the University Toulouse, France, were published online in the Journal of Applied Physics. The research was supported by the National Science Foundation, the U.S. Air Force Office of Scientific Research and the National Renewable Energy Laboratory. Bejan's theory, known as the constructal law, is based on the principle that flow systems evolve their designs over time to facilitate flow access, reducing and distributing friction or other forms of resistance. Bejan developed the principle 15 years ago, and has been using it to describe and predict a wide variety of man-made and natural phenomena. The current analysis views this ubiquitous S-curve (also known as the sigmoid function) as a natural design of flow systems. In the example of a new technology, after a slow initial acceptance, the rise can be imagined moving fast through established, though narrow, channels into the market place. This is the steep upslope of the "S."
As this technology matures, and its penetration slows, any growth, or flow, moves outward from the initial penetration channels in a shorter and slower manner. Bejan likes to the use metaphor of fingers stretching out to represent the initial invasive growth, with the placement of a glove over those fingers as a representation of the lateral consolidation phase. "It's like there are two lives – the first is long and fast, while the second phase is short and slow," Bejan said. "The trend begins with a quick 'invasion,' followed by a 'slower' consolidation. Then the trend hits a wall." This pattern matches that of the constructal theory, which uses a large river basin as a visual description of flow systems, growing fast and far, with smaller branches growing laterally from the main channels. "The prevalence of the S-curve phenomena in nature rivals that of the tree-shaped flows, which also unite the animate, inanimate and human realms," Bejan said. "This theory shows that this is not a coincidence – both are manifestations of the natural constructal tendency of flow systems to generate evolving designs that allow them to flow, spread and collect more easily."